Regency Fashion makes clothing using examples from the relevant style period. A small number of costumes is available for rental. Ask about the possibilities of costumemaking by sending an e-mail. For examples go to The Gown, Spencer & Pelisse or Regency Men’s Clothing. Or have a look at our Portfolio or Facebook. During the Regency or Empire period 1795-1820, clothing became informal in style: Brocade, lace, wigs and powder were no more. Regency fashion was influenced by ancient Greece and statues. Tight laced corsets were not needed for the high waist and natural shape, the simple skirt and wide neckline. Women at Court as Josephine (Napoleon’ s wife) and Jane Austen’s heroïnes, would have worn these clothes. When outside during the day, ladies wore half boots. When inside and in the evening flat shoes were worn. In the colours green, pink, blue and white. Men wore also tight fit clothing. The trousers and jackets, made from linen or wool. With wide blouse and waistcoat or vest, and a cravat draped around the collar, tight into a bow or a knot. The cravat was made of a light coloured strip of fabric. Men wore a neckband or cravat, draped over the collar. 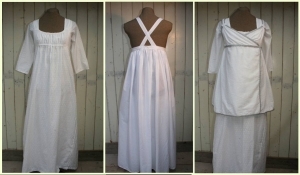 Made of a light coloured strip of fabric. It is possible that cravats were initially worn to hide shirts which were not immaculately clean. During the day long trousers were worn with boots. In the evening knee long trousers with flat shoes. Different to the Barok period not as much decoration and colour was used. 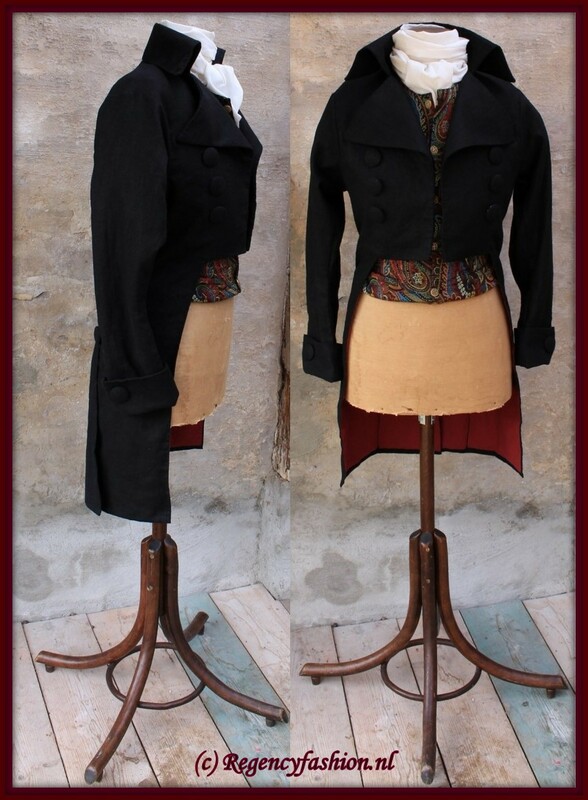 For more see Regency Men’s Clothing.